Also caled Sharp Needles. 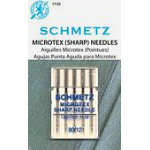 These have a very slim, acute point for easier peircing of very fine or densly woven fabrics. Use for precise stitching of edges, also for silk, microfober fabrics, coated materials, foils and artificial leather. System: 130705 HM. Size:1280. 5 needles per pack. Carded.